The Wharton Africa Business Forum took place in Philadelphia on November 3-5, 2017. Present were the Finance Minister of Nigeria, the CEO of Ethiopian Airlines and other business leaders (notably from lead sponsors McKinsey & Company and the Boston Consulting Group) and educators. The event was attended by hundreds of participants including Wharton faculty, students and alumni, African investors and entrepreneurs, members of the African diaspora and many others who have an interest in Africa. These are our notes from the event. They are not intended to be comprehensive. First, there was a tremendous amount of energy and optimism surrounding Africa developments. There were a palpable sense that Africa’s moment is coming and an urgency that it should not be squandered. 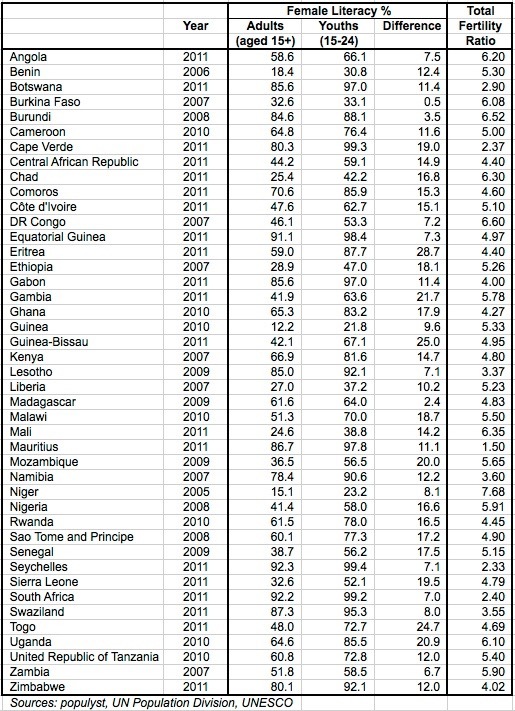 These sentiments are validated by our analysis of African demographics that show a coming decline in the dependency ratio and an accompanying increase in the odds of realizing some demographic dividend. 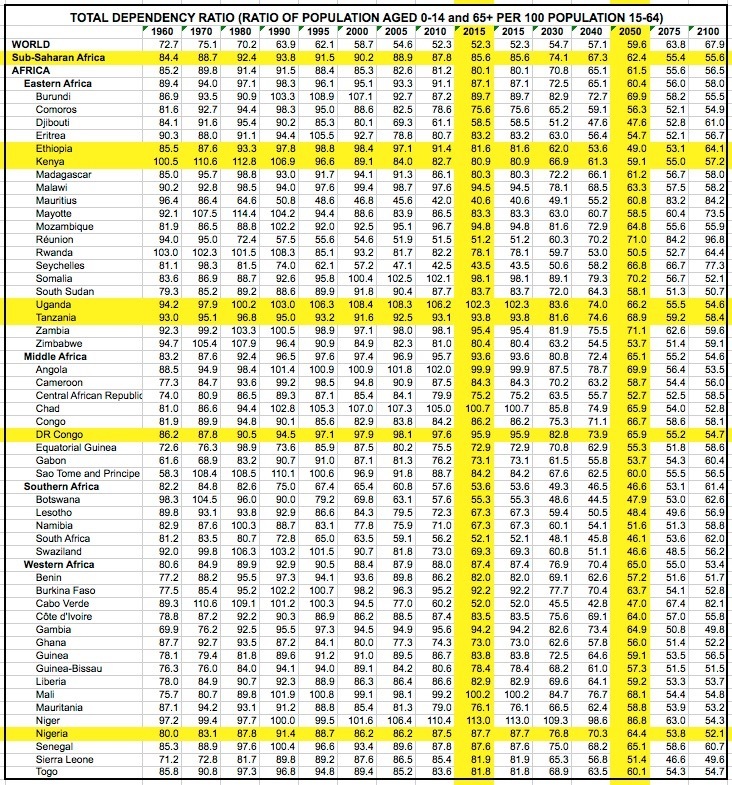 However, fertility rates remain too elevated and are not falling fast enough to deliver the massive dividend that was seen in China, the US and Europe in recent decades. Second, and very close on the heels of this optimism, there was a clear-eyed realization that nothing is guaranteed and everything remains to be done. It was said that “the 21st century will be the century of Africa”, with emphasis on this being a double-edged sword, meaning that it could be a century of growth and prosperity driven in large part by African demographics, or a century of spiraling calamity if reforms fail to come through as needed. Again, this is supported by our view that education, infrastructure and the fight against corruption all need to make a quantum leap before the African economy can surge forward in a sustained fashion. In our view, the first links in this chain reaction have to be a big improvement in female literacy and a closing of the gender gap. 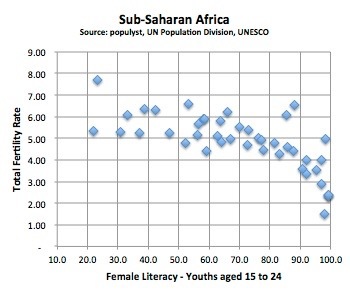 As shown in the graph, fertility falls quickly when literacy rises over 80%. Third, there was more attention paid to bottom-up developments: exciting new startups across the entire continent, pro-active NGOs and angel investors assisting local projects etc. And there was less discussion of the need to build the adequate large-scale architecture to facilitate and accelerate the work of entrepreneurs and investors. This architecture, the superstructure of the economy, is a top-down effort where populyst has claimed an active role: to assist in the building of robust institutions to improve governance, education and infrastructure and to lower corruption. Africa’s “high five” priorities are 1) Feed Africa (food self-sufficiency), 2) Light up Africa (boost the electricity supply), 3) Industrialize Africa, 4) Integrate Africa (encourage intra-Africa trade, tourism etc. ), 5) Educate Africa.